Due to a long standing commitment to provide not only a prefect wedding and holiday experience but also seamless customer satisfaction, Sanya Marriott Resort & Spa is honored to have received six outstanding hospitality awards in 2011. They are: “Most Creative Wedding Hotel 2011” by COSMO Bride Magazine, “Best Resort Hotel 2011” by National Geographic China Magazine, “China Top 100 Hotel 2011” by Travel + Leisure Magazine, “Top 10 Wedding Hotels in Hainan 2011” by Lifestyle Magazine, “Top 10 Luxury Honeymoon Resort Hotel Sanya 2011” and “Top 10 Luxury Family Resort Hotel Sanya 2011” by Gootrip Magazine. By reader votes, users comments and expert review, the award gives recognition of Sanya Marriott Resort & Spa’s magnificent Ocean Front Chapel and creative personal combing to pioneer a stylish beach wedding destination. The Gold List-Award of China Tourism aims to recognize excellence in the hospitality industry. Categories include hotels & resorts, airlines, travel agents and tourism boards. The Gold List is decided by a combination of a readers’ poll and Industry experts’ recommendations. Out of 300 participates only 80 are selected for an elite Gold List Award. The award reflects Sanya Marriott Resort & Spa’s long standing commitment to providing a prefect holiday experience and seamless customer satisfaction. Travel + Leisure Magazine’s 2011 China Travel Award selection was announced in October after five months of comprehensive expert review, reader voting. Sanya Marriott Resort & Spa was proud to be named a “China Top 100 Hotel”. Lifestyle Magazine is one of the most influential bilingual Living Magazines. LifeStyle Magazine hosted an online contest to decide the "Top 10 Wedding Hotels in Hainan”. Sanya Marriott Resort & Spa was honored to be included in this esteemed list. 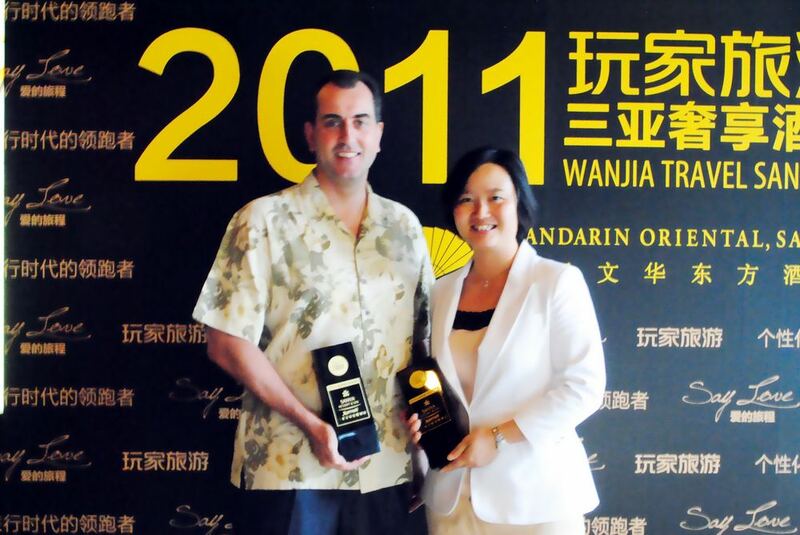 Sanya Marriott Resort & Spa was awarded both the “Top 10 Luxury Honeymoon Resort Hotel Sanya 2011” by Gootrip Magazine. The result was made public exclusively on popular Hainan travel websites such sanyatour, sanyahainan, Hinews and 100T. Sanya Marriott Resort & Spa was proud to receive the “Top 10 Luxury Family Resort Hotel Sanya 2011” by Gootrip Magazine, showcasing the fact that in addition to a romantic destination for couples, Sanya Marriott is also a hit with families thanks to its extensive Kid’s Club and related children’s facilities. Nestled on the pristine white-sand beaches of China’s only tropical island, Sanya Yalong Bay Marriott Resort & Spa is the perfect choice for a relaxing escape. The exclusive beach resort is conveniently located just a 35-minute drive from Sanya Phoenix International Airport. Designed with vibrant colors, natural stone and warm woods to reflect its spectacular surroundings, Sanya Yalong Bay Resort & Spa offers 452 well-appointed rooms and suites. Multiple swimming pools, a Clubhouse, Fitness Centre and signature Quan Spa combined with a comprehensive range of meeting facilities including an Ocean Front Chapel, make it the perfect choice for holidays, meetings and celebrations of all kinds. The tranquil ocean and tropical mountain views beckon guests to sit back and relax in peace. It is the place that you have always wanted to go and never wanted to leave!